Stack 'em up high! 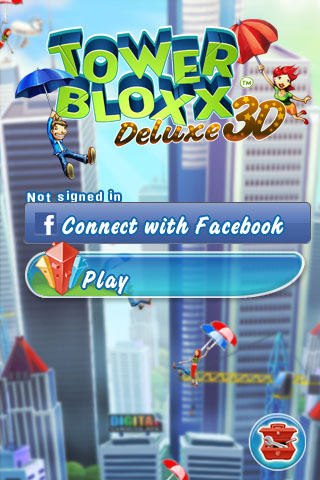 That's your objective in Digital Chocolate's fun app Tower Bloxx Deluxe 3D, where architecture construction is limitless and supreme sky scraper's rule the skies. How tall can you build one? Your objective is to create tall skyscrapers that are structurally sound. Gameplay is simple, stack building blocks one on top of the other. The block will come down from the top of the screen and swing from left to right, time it correctly so that the block lands in to the center of the area it needs to be. The higher you stack blocks the more the new blocks sway from left to right and the more the building sways from left to right, thus making it harder to time a perfect block dismount on to the previous one. If you land a block perfectly on top of the other you'll start a combo! 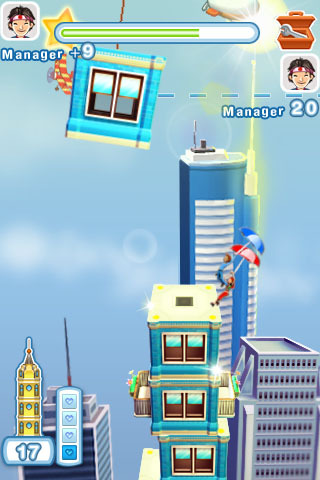 Stack up your building as high as you can to earn more points, you earn 1 point for each successfully placed block. You have 4 lives in quick play until the games is over. The cities are split up in to different sections, the first of which is Toonfield Grove. Develop and successfully construct buildings in each quadrant of a section to unlock the next. Launch iTunes! DigitalChocolate.com Coming Soon!